WILDERNESS LIGHTING SCENE LIGHT - 30"
Our DUPLEX 5 - 30" SCENE light gives an impressive 120 degree spread of light making it an ideal close area light. Fitted with four sided reflectors with the LEDs mounted closely together in the centre. The wide aspect of the reflector creates an incredible 120 degree spread of even light compared to a Diffused light with is only 60 degrees. As the reflector is straight edged the light emitted can be concentrated in a specific area by the operator. Ideal when you do not want glare off the side of a vehicle. 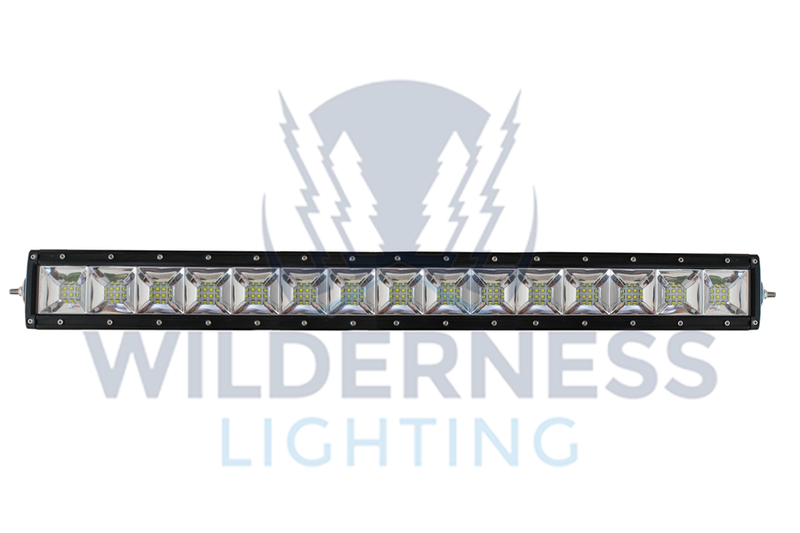 The light belongs to our range of double row light bars, these small yet very powerful lights produce a massive 16,800 Lumens of light from 60 x 5 watt OSLON white LED chips. The low energy consumption technology means they only consume 12.7 amps of power. Compare these figures to a standard 55 watt halogen light found on many vehicles which produce only 900 lumens of light while drawing 4.6 amps of power.